Whey Protein Blend (Whey Protein concentrate, Whey Protein Isolate, Whey Peptides), Chocolate Cookie Pieces, Non-Fat Dry Milk, Natural & Artificial Flavor, Xanthan Gum, Sodium Chloride, Steiva Sucralose, L-Glutamine. Whey Protein Blend (Whey Protein Concentrate, Whey Protein Isolate, Whey Peptides), Natural & Artificial Flavor, Xanthan Gum, Carrageenan, Stevia, Salt, Sucralose, L-Glutamine. Whey Protein Blend (Whey Protein Concentrate, Whey Protein Isolate, Whey Peptides), Cocoa Powder, Natural & Artificial Flavor, Xanthan Gum, Carrageenan, Stevia, Soy Lecithin, Salt, Sucralose, L-Glutamine. Whey Protein Blend (Whey Protein Concentrate, Whey Protein Isolate, Whey Peptides), Natural & Artificial Flavor, Xanthan Gum, Red Beet Powder, Carrageenan, Stevia, Soy Lecithin, Salt, Sucralose, L-Glutamine. Whey Protein Blend (Whey Protein Concentrate, Whey Protein Isolate, Whey Peptides), Natural & Artificial Flavor, Xanthan Gum, Red Beet Powder, Carrageenan, Stevia, Salt, Sucralose, L-Glutamine. Add 1 level scoop to 8 ounces of milk, water, juice or your favorite beverage. BodyStrong's 100% Whey Protein mixes instantly with just a spoon. It can also be added to cereal, oatmeal, yogurt, baked goods and sauces to increase their protein content. Take 1-4 servings daily. Who uses BodyStrong 100% Whey? 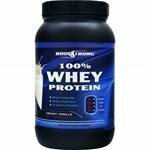 Why use BodyStrong’s 100% Whey Protein? •Consider mixing it with your morning coffee for a high protein creamer. * •After a workout: Nothing beats whey protein for post workout nutrition because it digests quickly, assisting with muscle recovery and growth. * •As a snack: Have a shake in between meals to help curb your appetite. * •As a meal replacement: Use in place of a high calorie meal if you’re dieting or trying to lose weight. * •As a meal supplement: Have with a meal to increase your daily protein intake. * •As a nutrition booster: Mix BodyStrong Whey Protein in smoothies, oatmeal, milk, cookie mix, sauces, yogurt and baked goods to increase their protein content. * * These statements have not been evaluated by the FDA. This product is not intended to diagnose, treat, cure or prevent any diseases. Whether you're a bodybuilder, athlete, business professional, student, or a busy homemaker, protein is an essential component of overall health! BodyStrong's 100% Whey Protein gives you a quick and economical way to increase your daily protein intake. Each serving contains a complete array of whey protein fractions, is high in the essential amino acids and rich in glutamine peptides, giving you the right tools for muscle growth and preservation. It is ideal for anyone looking to boost the protein content of their diet. BodyStrong's 100% Whey Protein is a blend of the highest quality whey protein concentrate, whey protein isolate and quick absorbing whey peptides. By combining these top quality protein sources with superior flavoring components, BodyStrong has developed a low fat, low carb, low sugar formula packed with a whopping 25 grams of protein in every scoop. It is cold processed, micro-filtered, and undenatured, to produce the most wholesome form of whey protein available.